It’s no surprise that I am not a big yoga girl. I want to be, but I am just right now. I wish I was, but I am not. I like to try classes and should be doing it more than I am because I like it when I go but I always spend way more time jumping around, cycling or running. When I got My Yoga Loop in the mail to review I was looking forward to it because I thought, “this will be another good reason for me to start doing more Yoga.” I have a mat and there are lots of great studios near by. And so after vacation, I am going to try to add a yoga class to my week. A hot, sweaty, make your legs shake class that will feel good and be good for me. In the mean time, I have been trying some Yoga Downloads, and using the Yoga Free App. on my phone once in a while. I really like how My Yoga Loop works to stretch me, help try a pose and carry my mat. 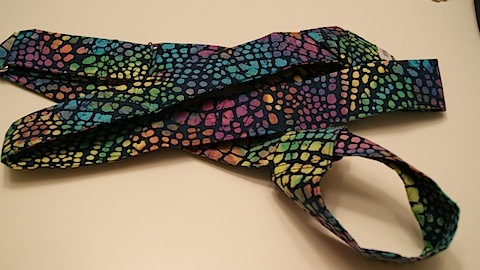 The loops on each end adjust to fit on a mat or be used as a prop. 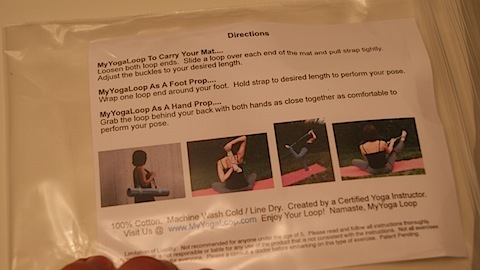 MyYogaLoop™ can be used as a strap to wrap and carry your mat. With the easy-to-slide buckles, MyYogaLoop™ can be adjusted to a length that is a comfortable fit on your shoulder. MyYogaLoop™ can be used as a prop to assist when hands are not able to grasp each other. Therefore this helps you to expand, open and blossom in your pose. MyYogaLoop™ can be used to loop your feet, allowing you to hold the pose longer so that you can feel the healing effects. Slide a loop over each end of the mat. Pull strap tightly and adjust buckles. Grab the loop behind your back with both hands as close together as comfortable to perform your pose. Wrap one loop end around your foot. Hold strap to desired length to perform the pose. I think it would be a great gift for a Yoga Lover or Beginner.